During the Holiday of Sukkos, we observe the Mitzvah of the Lulav & Esrog (The Four Kinds). We are pleased to make this beautiful Mitzvah available to every family in our community. 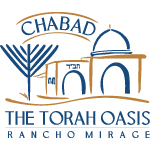 Chabad of Rancho Mirage is offering a special opportunity of ordering your own Lulav and Etrog set which will be picked up from Los Angeles and will be available for pickup at Chabad. Price for the set will be confirmed when your order is placed. Please let us know by September 14. Optional: Help Chabad bring more light to the community with your generous contribution.